“Going green” is becoming a popular business model, and building developers are exploring eco-friendly options to save money and create consumer appeal. 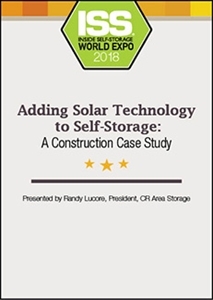 Solar panels can be a great addition to self-storage facilities, with their large swaths of rooftop space. They can lower utility expenses and may come with financial incentives. Our speaker will share his decision to add this technology to his three Iowa facilities, sharing pros, cons, tips and more.